Sir Charles Coote (1588-1642) was an English soldier, who moved to Ireland, where he served in the Nine Years' War and was present at the Battle of Kinsale. In 1605 he was appointed provost-marshall of Connacht, before marrying Dorothea Cuffe in 1610. By 1621 Coote was created a Baronet of Ireland. He promoted the plantation of Ireland and was anti-Catholicism. The land, originally belonging to the O'Dunnes, had been granted to him. He named the area Castlecuffe, after his wife's family. The house was abandoned by 1641. 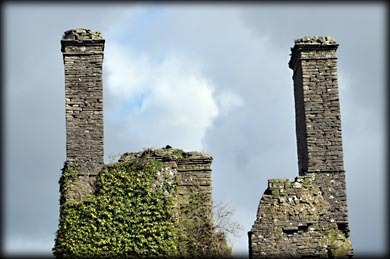 As I approach the castle from the east, the structure had a real WOW factor, all I could see were these huge Jacobean style chimney stacks towering over the trees. I was greatly disappointed when I reached the building. 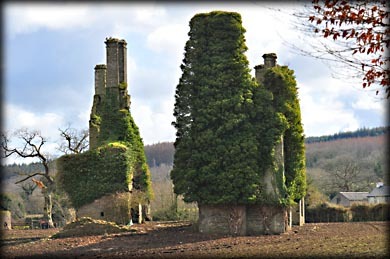 It was originally a H-shaped plan with projecting wings, but only the impressive chimneys and their associated fireplaces remain. 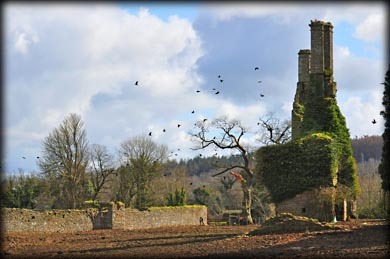 Situated: Castlecuffe Castle is 18.5 kilometres west of Mountmellick. Take the R 422 through Rosenallis and Clonaslee. 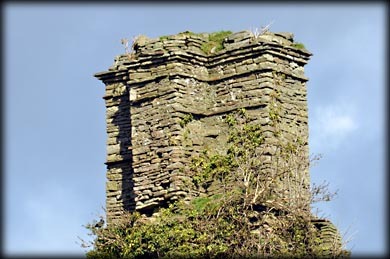 The ruin stands on private farmland, about 4 kilometres beyond Clonaslee, on the northside of the R 422. Discovery Map 54: N 2808 1128. Last visit Mar 2018.